It's the quiet ones you've got to watch. 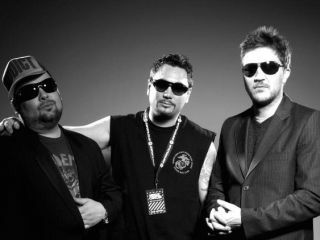 US hip-rockers Fun Lovin' Criminals have played the world's first silent gig at Koko in London. Fans listened through headphones as the band ran through their set. To keep things quiet, drummer Frank Benbini played in a soundproofed booth. The gig was an evolution of the Silent Disco concept that originated at the Glastonbury Festival in 2005 in a bid to keep the noise down. This involved mud-loving clubbers listening to a DJ through cans rather than a PA.
As FLC's singer/guitarist Huey points out, the big advantage of the silent gig is that everyone gets to hear a good mix - it doesn't matter where you're standing. You can even continue to enjoy the music in the toilet. On the flip side, it's surely more difficult to get a crowd going when everyone's listening experience is personal, but the BBC reports that most punters seemed to find the concept agreeable. Now all we need is for Razorlight to play a silent gig. Where no one gets headphones.